It's been eerily quiet in here for a while so I decided to post this simple potato recipe that I made today. It's one of my favourite vegetables and one of the few vegetables that you can never go wrong with. They taste delicious whether deep-fried, baked, roasted, mashed, curried or made into soup. They are not only a comfort food to many, potatoes are also a staple in many countries. Here in Sweden, one of the popular ways to prepare potatoes is by cutting them into 6-8 pieces and baking or roasting them, usually with the skin, with herbs and spices. This way of preparing the potatoes is called klyftpotatis in Swedish. You can season klyftpotatis with endless herbs. I have used a classic Swedish combination, dill and potatoes. You could replace dill with thyme or rosemary. This recipe deserves to be up here because this is the first time I baked the potatoes without peeling them. Since the skin of potatoes also contains vitamins and minerals, it is often advised to cook them unpeeled. Though, I have no problems eating baked and roasted potatoes served with skin when dining out, I could not make myself prepare the potatoes that way at home until now. Also, please avoid using any potatoes that have developed green areas. Removing or peeling the green areas is not sufficient to remove the toxins from the potatoes. I baked these in butter but you could replace the butter with a good oil, if you wish, and adjust spices and herbs as per your likings. Heat the oven to 200 C (about 400 F). Add the butter in a large oven-safe, ceramic dish and place it in the oven. Rinse and scrub the potatoes under water. 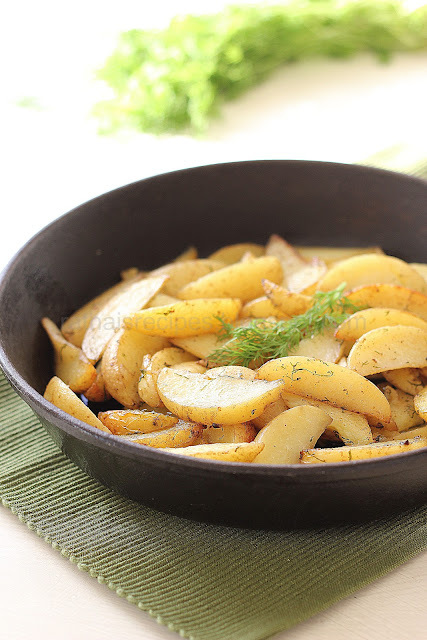 Dry and cut the potatoes into wedges. The smaller the less time they'll take to get baked. In a large bowl, add the potatoes, salt, pepper and finely chopped dill and mix well until the all the potatoes are well-coated with the herbs and spices. Once the butter has melted, bring the ceramic dish out of the oven and place all the potatoes in there and put back in the oven. Bake the potatoes for about 30 minutes or so until soft. Serve them warm with anything of your choice! Btw,how is the health? Hope you recovered from cold n sour throat! :) take care! looking so cute potatoes........really.believe me..and perfectly done.. The potatoes look gorgeous! Love the golden hue on them! We love potatoes, and I like roasting them with skins on! Love the herbs that goes with the potatoes! My family would definitely love this! Love these I bake them the same way, changing herbs for different flavours. Cooked in butter and dill added equals deliciousness to me. potatoes look so cute. pica are beautiful. I like bit of spicy so i would add chili flakes. but its personal choice. Simple Yummy potato dish !! Potatoes are all time favorite and adding herbs to the dish are always a winner! I love roasting potatoes and changing up the flavors by changing the herbs. I've never used dill so this is exciting! Another herb to try! Because I only buy organic potatoes and then scrub them, I don't worry about the peel. In fact, I love the peel! Glad to see you giving it a try. Your potatoes look beautiful and delicious! Lovely presentation! And I would love to try potatoes served in this delicious way. They are my favourite too! These look so good and what a simple recipe to make! My husband's going to love this! thanks for the birthday wishes dear...wow...the baked potaoes look absolutely yum dear !Im definitely going to try this sometime...bookmarked ! Never used unpeeled potatoes. This is a very interesting recipe. How to make lemon curd? The content on this blog 'Rathai's Recipes', is licensed under a Creative Commons Attribution-NonCommercial-NoDerivs 3.0 Unported License.